Reduce the Risk of Alzheimer’s Disease by 90%Optimize Your Cognitive FunctionThe must-read summary of “The Alzheimer's Solution: A Breakthrough Program to Prevent and Reverse the Symptoms of Cognitive Decline at Every Age,” by Dean & Ayesha Sherzai, MD.This complete summary of Dean & Ayesha Sherzai’s book explains the biology of Alzheimer’s disease and the five-part program to prevent and reverse cognitive decline. By following this program, ninety percent of us can avoid ever getting Alzheimer’s. The ten percent with strong genetic risk for Alzheimer’s can delay the disease by ten to fifteen years. Those diagnosed with the disease can reverse the symptoms, be cognitively active, and add healthy years to life.This guide includes:	Book Summary—The summary helps you understand the key ideas and recommendations. Online Videos—On-demand replay of public lectures, and seminars on the topics covered in the chapter.Value-added of this guide:	Save time	Understand key concepts	Expand your knowledgeRead this summary and apply the ideas to prevent and reverse the symptoms of this debilitating illness that threaten you and your loved ones. The second section presents the NEURO plan, a personalized treatment program for Alzheimer’s patients. This five-part program has guided thousands of patients making lifestyle changes to reverse Alzheimer’s symptoms. By following this program, ninety percent of us can avoid ever getting Alzheimer’s. The ten percent with strong genetic risk for cognitive decline can delay the disease by ten to fifteen years. Dean Sherzai, MD, Ph.D., is a neurologist and codirector of the Brain Health and Alzheimer’s Prevention Program at Loma Linda University. He completed his fellowships in neurodegenerative diseases and dementia at the National Institutes of Health and University of California, San Diego. He also holds a Ph.D. in healthcare leadership with a focus on community health from Andrews University. Ayesha Sherzai, M.D., is a neurologist and codirector of the Brain Health and Alzheimer’s Prevention Program at Loma Linda University. She completed a fellowship in lifestyle and vascular brain diseases at Columbia University. She leads the Lifestyle Program for the Prevention of Neurological diseases at Loma Linda. Alzheimer's disease is the sixth leading cause of death in the United States. Six million people in the United States and 47 million worldwide are living with Alzheimer’s today. In the next decade, ten percent of people over age 65 will develop dementia, and 50 percent of people over age 85 will have Alzheimer's. The World Health Organization estimated that the number of people with Alzheimer’s will rise to 135.5 million worldwide by 2050. 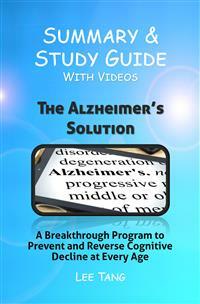 There is no cure for Alzheimer’s disease once it has manifested. But we can prevent and reverse the cognitive decline with lifestyle change. Dean and Ayesha Sherzai at the Loma Linda University Medical Center has guided thousands of patients using a five-part program to prevent and reverse Alzheimer’s symptoms. By following this program, ninety percent of us can avoid ever getting Alzheimer’s. The ten percent with strong genetic risk for Alzheimer’s can delay the disease by ten to fifteen years. Those diagnosed with the disease can reverse the symptoms, be cognitively active, and add healthy years to life. In November 1901, Dr. Alois Alzheimer at the Frankfurt Psychiatric Hospital examined a patient with an unusual mental illness. Her symptoms included memory loss, language problems, and delusional behavior. Alzheimer examined her brain after she died in 1906 to discover what caused her disease. He found strange formations of amyloid plaques and tau tangles in her brain. These plaques and tangles are now considered the hallmark pathology of Alzheimer’s disease. People with Alzheimer's lose memory, language skills, and the ability to perceive time and space. Alzheimer’s disease is the most common type of dementia. It accounts for 60 to 80 percent of dementia cases. The underlying disease starts decade or more before diagnosis. Majority of patients notice their first symptoms in their mid-60s to early 70s. The risk of developing Alzheimer’s depends on your age, genetic profile, and lifestyle choices.